Disclaimer: I received a free entry into the Urban Bourbon Half Marathon as part of being a BibRave Pro. Learn more about becoming a BibRave Pro (ambassador), and check out BibRave.com to review find and write race reviews! 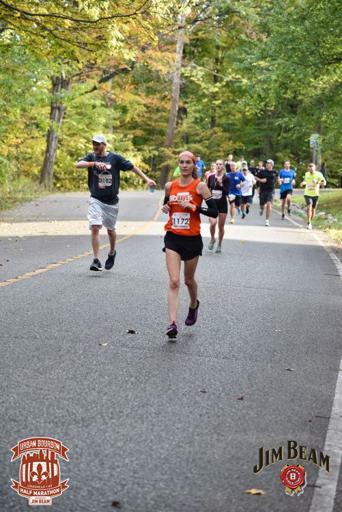 I had a few tough weeks leading up to this race including the OX 12 Hour and the Detroit Free Press Marathon. 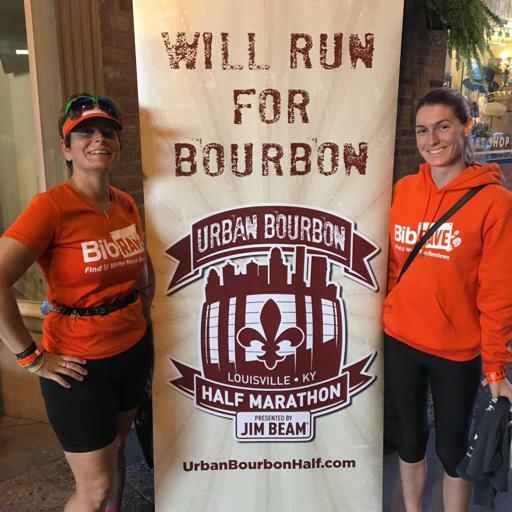 Expectations were low for this race and I mostly wanted to enjoy visiting Louisville for the first time and trying some bourbon. 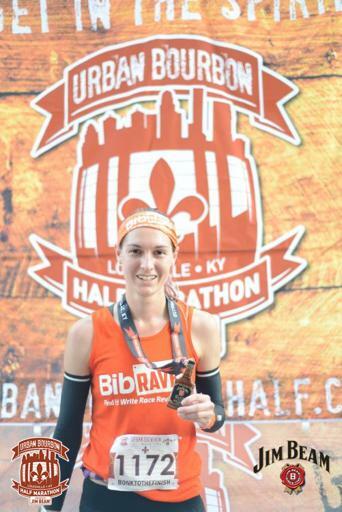 Plus, I knew that Louisville was more hilly than what I'm used to in the flatlands of Columbus. The packet pickup was moved a few weeks out from race day. The change was far enough in advance that I didn't mind. A big plus of the venue change was that parking would be free vs. the old location where I would have had to pay to park. So obviously this was a change that I wasn't going to complain about! I drove in Friday afternoon from Columbus. As this race is on Saturday I needed to get in by Friday for the packet pick up since I'm an out-of-towner. It didn't end up being a big deal for me but I thought that this could be a perfect race to implement the option of having your packet shipped to you for an extra fee. There was more than enough parking at the venue. After being in a car for 4+ hours though the first thing I wanted to do was find a bathroom which was somewhat difficult. There were many art galleries and restaurants but since I wasn't going to buy anything I didn't want to impose on small shops. Eventually I found a public bathroom down a hallway in what seemed like a maze. Now onto the actual packet pickup! 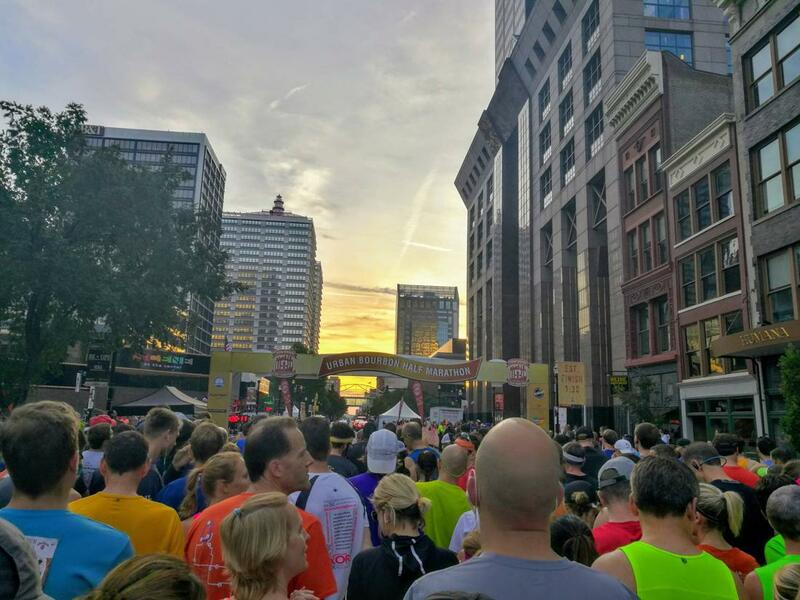 There was a sign outside to look up your bib number. You needed to remember this number as once you got in the tables were organized by race number. When you got your bib you also got a wristband for the afterparty if you had a valid ID. I LOVED this. 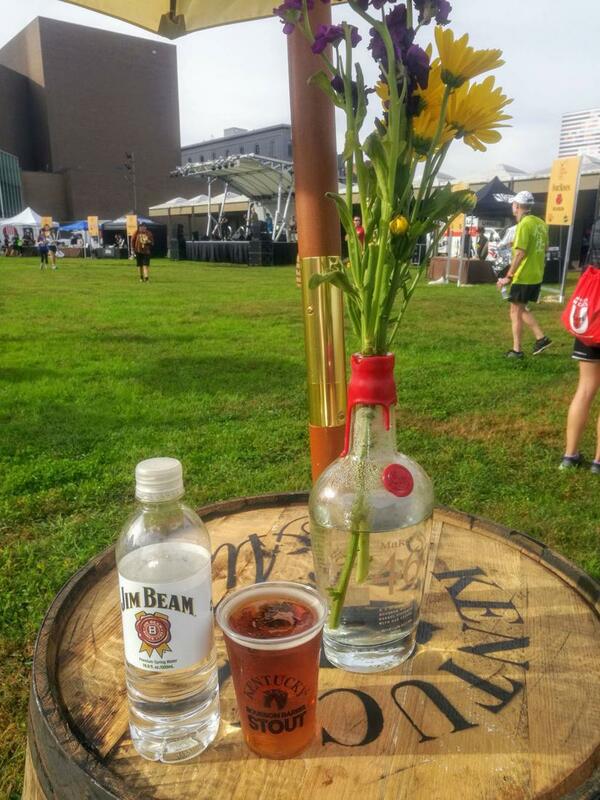 Too often at races I have to go all the way back to my car or pass on the included alcohol because I don't like to carry my ID when I run. Rock 'n' Roll Series should take note! I couldn't get my free beer at the end of Rock 'n' Roll San Diego even though my bib clearly stated I was old enough. Poor planning on my part but it's just not something I remember to run with. 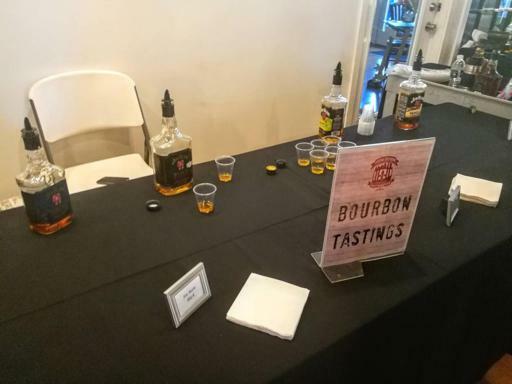 After picking up what I needed I headed over to the bourbon tasting table! 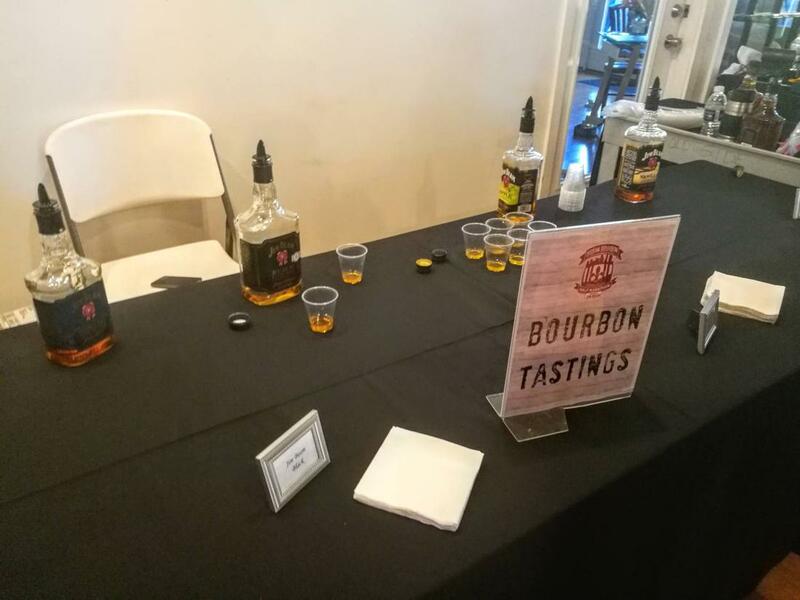 I tried vanilla bourbon which was good! Next up was buying my custom engraved Jim Beam bottle. 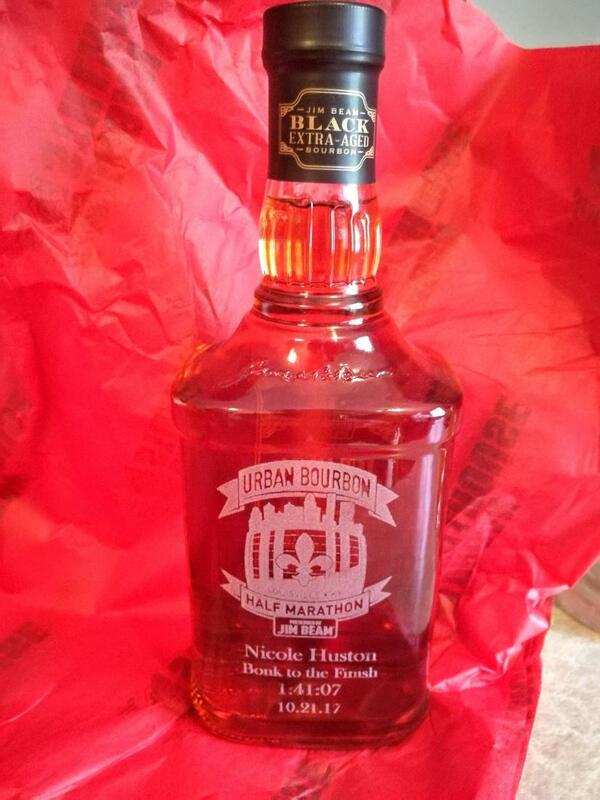 The bottle came with the race logo as well as 3-4 lines of text of your chosing. 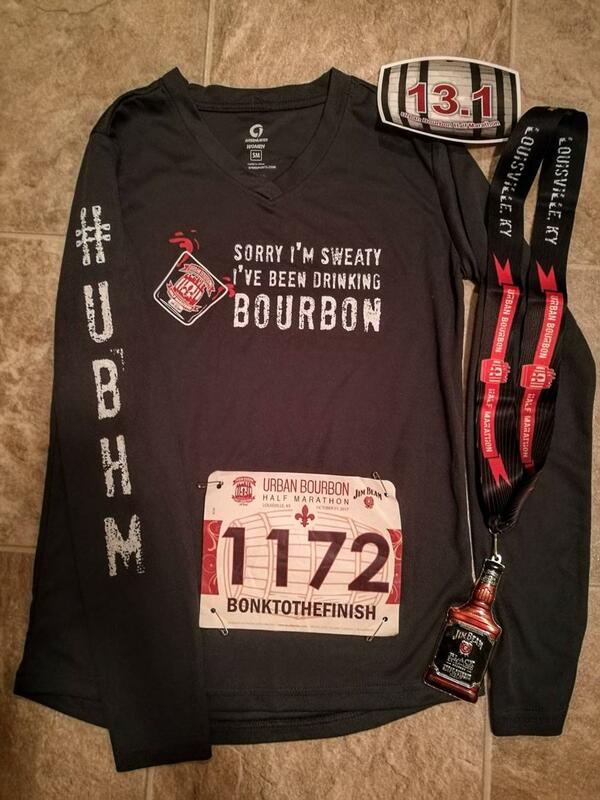 You ordered it and picked it up after the race on 4th Street Live the next day. For $30 + tax it was hard to pass up. Also inside was a table for purchasing additional Urban Bourbon gear and a booth from Fleet Feet if you needed any last minute racing gear or nutrition. My lodging was with a friend just outside of the downtown area. The streets were set to start closing at 7:30 so I came in around 7, more than enough time to find parking. I ended up sitting in my car for a while to kill time. 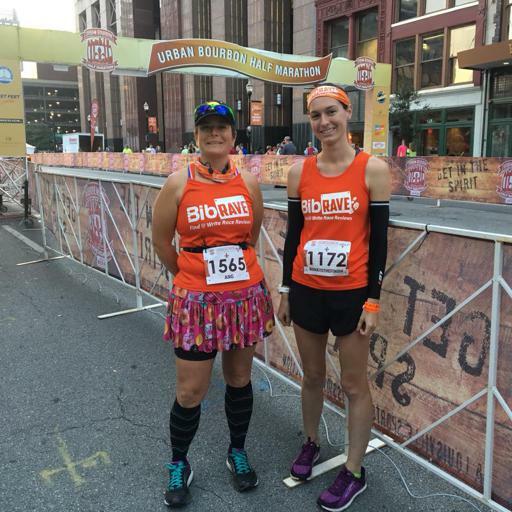 I met up with another BibRave Pro, Angie, before the race. I lined up at the start near the 1:50 pace group. As the race was off I tried starting at a comfortable pace and not looking at my watch. A mile ticked by and my watch beeped. I looked down. 7:54/mile. Nonononono. This is not what I wanted. Way too fast. The mile was somewhat downhill so I figured it would even out. I continued running what felt comfortable. Except my next two miles were 7:44 pace. At this point I was torn. On one hand the pace was feeling pretty good. On the other hand I knew I had done WAY too many miles yesterday. Surely those long miles would catch up to me soon if I kept this up… Next mile: 7:30. Well screw it I'll just go with the flow and if I run out of steam at least there will be plenty of bourbon waiting for me at the finish. I tried to slow my pace for the next two miles but was still hitting miles under 7:40 pace. Then at mile 5.5 I decided it would be a great time to eat a Gin Gin. It's basically a chewy ginger flavored candy. I love these for ultras and marathons because they settle my stomach. I figured if I took one early I could keep my stomach under control. I've never had them before at a half marathon. I was breathing heavier than I typically do for a full marathon (obviously). Next thing I know I feel ginger flavor running down the wrong pipe into my lungs. It was burning so much. Of course I decided to eat it right AFTER a water stop so I knew I wouldn't have anything to wash it down with for a while. I was coughing like crazy but it didn't help at all. The pain lasted for several miles. Never will I eat a Gin Gin again at a half. Maybe I need to find ginger gels or something instead. The next part of the course was through some parks which were beautiful! I was told by my friend I was staying with that the parks of Louisville were designed by the same person who designed Central Park. The more you know! The parks also brought the worst hills of the course. I clocked some of my slowest miles in here and wondered if I'd be able to pick it back up once I headed towards downtown. Around mile 10 I knew I'd be coming in close to my old PR of 1:43:01. I was struggling to do exact math and ran my fastest mile at mile 11 as I was stressing about hitting a PR. Then I realized I still had 2 more miles to go and returned back to a slightly slower pace. I was looking for the 1:40 pacer hoping that if I could at least see him off in the distance I'd feel more confident. I never did. Mile 13 felt hard with a combination of wind and overall soreness. 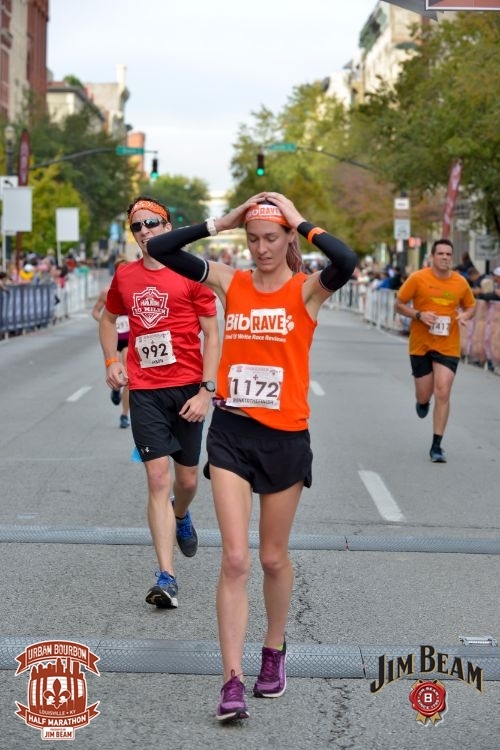 There was a final turn onto the last stretch into the finish and I was running as fast as my legs would let me go. I was not expecting that! I was happy with this effort of running mostly negative splits (excluding the hilly parks in the middle of the course). Next off to the after party that offered pizza, soup, bourbon beer, and bourbon. It was pretty deserted when I got there but filled up quick! After the after party I headed over to 4th Street Live to pick up my bourbon bottle. When I had initially purchased the bottle I asked not to have my finishers time printed on the bottle because I didn't think I'd get a good time. Luckily, when I arrived they hadn't yet finalized my bottle so there was still time to add my snazzy new PR! And that's it! I thought this race was an awesome destination race. The crowd support was more than I expected. PRing was an added bonus. I could easily see myself coming back to this race again. OH! I almost forgot. The race pictures were all FREE! I didn't know this before the race so it was a nice surprise email to receive afterwards.